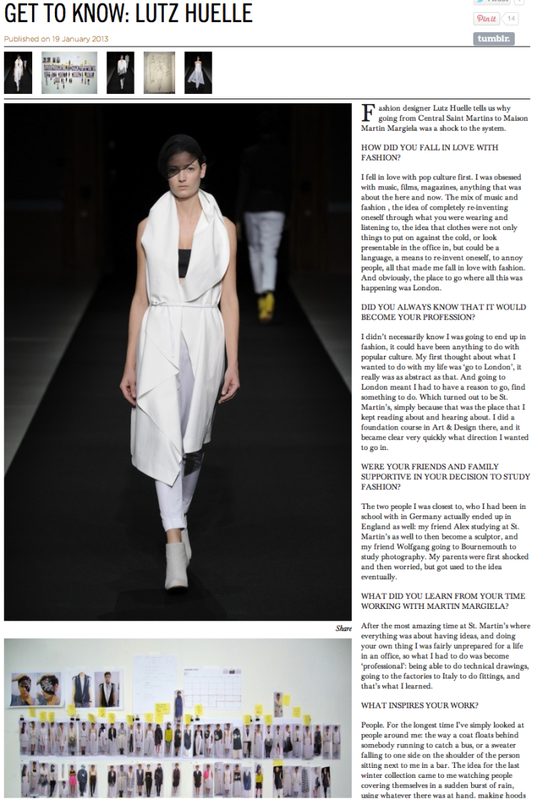 Lutz Huelle on HUNGER TV ‘WHAT WAS THE INSPIRATION FOR THE LATEST COLLECTION? There was a girl standing in front of me in the line at the supermarket, striking the most amazing pose, really like one of those couture models in the 50s and 60s, hips tilted just so, head leaning to one side, arms slightly curved. It suddenly completely transformed the moment and made me think of how little it can take to look beautiful – just the way someone holds themselves, a gesture, a flick of the head. So I started thinking of the idea of couture, and the poise that comes with it, but in everyday garments- a trench coat, cut in swathes of fabric, or a biker jacket with a low plunging V neck. It turned out to be the most ‘couture’ or sophisticated collection I’ve ever done. Fashion designer Lutz Huelle tells us why going from Central Saint Martins to Maison Martin Margiela was a shock to the system. HOW DID YOU FALL IN LOVE WITH FASHION? I fell in love with pop culture first. I was obsessed with music, films, magazines, anything that was about the here and now. The mix of music and fashion , the idea of completely re-inventing oneself through what you were wearing and listening to, the idea that clothes were not only things to put on against the cold, or look presentable in the office in, but could be a language, a means to re-invent oneself, to annoy people, all that made me fall in love with fashion. And obviously, the place to go where all this was happening was London. DID YOU ALWAYS KNOW THAT IT WOULD BECOME YOUR PROFESSION? I didn’t necessarily know I was going to end up in fashion, it could have been anything to do with popular culture. My first thought about what I wanted to do with my life was ‘go to London’, it really was as abstract as that. And going to London meant I had to have a reason to go, find something to do. Which turned out to be St. Martin’s, simply because that was the place that I kept reading about and hearing about. I did a foundation course in Art & Design there, and it became clear very quickly what direction I wanted to go in. WERE YOUR FRIENDS AND FAMILY SUPPORTIVE IN YOUR DECISION TO STUDY FASHION? The two people I was closest to, who I had been in school with in Germany actually ended up in England as well: my friend Alex studying at St. Martin’s as well to then become a sculptor, and my friend Wolfgang going to Bournemouth to study photography. My parents were first shocked and then worried, but got used to the idea eventually. WHAT DID YOU LEARN FROM YOUR TIME WORKING WITH MARTIN MARGIELA? After the most amazing time at St. Martin’s where everything was about having ideas, and doing your own thing I was fairly unprepared for a life in an office, so what I had to do was become ‘professional’: being able to do technical drawings, going to the factories to Italy to do fittings, and that’s what I learned. People. For the longest time I’ve simply looked at people around me: the way a coat floats behind somebody running to catch a bus, or a sweater falling to one side on the shoulder of the person sitting next to me in a bar. The idea for the last winter collection came to me watching people covering themselves in a sudden burst of rain, using whatever there was at hand, making hoods out of plastic bags. I’ve always been inspired by things around me, sometimes the most mundane stuff. It’s only with the next collection that I was suddenly thinking of something more abstract, less real. Real life somehow seems less inspiring right now. WHAT WAS THE INSPIRATION FOR THE LATEST COLLECTION? There was a girl standing in front of me in the line at the supermarket, striking the most amazing pose, really like one of those couture models in the 50s and 60s, hips tilted just so, head leaning to one side, arms slightly curved. It suddenly completely transformed the moment and made me think of how little it can take to look beautiful – just the way someone holds itself, a gesture, a flick of the head. So I started thinking of the idea of couture, and the poise that comes with it, but in everyday garments- a trench coat, cut in swathes of fabric, or a biker jacket with a low plunging V neck. It turned out to be the most ‘couture’ or sophisticated collection I’ve ever done. There are loads of people that I find inspiring for different reasons – Cate Blanchett and Robyn, are two. I also love Michelle Obama and Florence Welch. WHAT DO YOU THINK THE DIFFERENCES ARE BETWEEN FASHION IN PARIS AND LONDON? I love both and wouldn’t want to be without either – Paris is beautiful and romantic and people often have impeccable taste and a feeling for what is ‘right’ right now, London is individual and inspiring and energetic and most of all fun. I just wish I could be there more often now. YOU WORK AS A VISITING TUTOR AT CSM – WHAT ADVICE DO YOU GIVE ASPIRING FASHION DESIGNERS? I guess it’s that the most important thing is to believe in oneself . And to be ready to have very long working hours. Love and life and salted caramel macaroons.